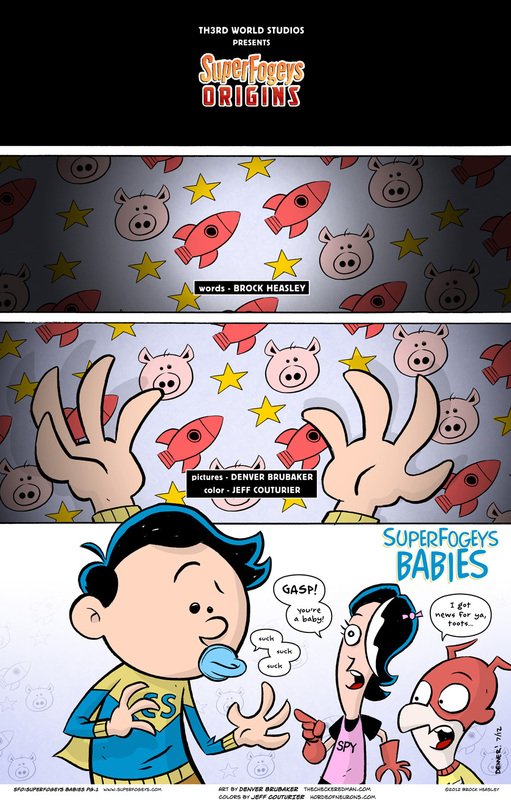 Welcome to SuperFogeys Babies–the most ill-advised SuperFogeys Origins story yet! I know, I know. In the history of hacky ideas, is there one worse than doing baby versions of your characters? Probably not, but why let that stop us? I can only promise this: it’s gonna be FUN. My cohorts this time out are artist Denver Brubaker and colorist Jeff Couturier. I think you’ll agree they turned out something really special. The page above is only a HINT of what will be a 12-page story, all told. The best part of this story? It’s all IN-CONTINUITY. Because that’s how we roll here at SF Central. Denver speaks truth. You’re getting the barest hint here. Next week, you’ll get to see the rest of the cast. CS is a baby and Spygal became a cyclops. j/k she may be a Cougar now though. Is this the work of the evil Dr Rocket? D’oh! Don’t spoil it, Jeff! This is awesome, right out of the gate (or crib, as it were). I have to say, a comic about what happens to superheros when they get old and retire has to be the single most ridiculous place to use the “all your favorite characters as babies” gimmick.